Lonsdale was an industrious portraitist who had trained with George Romney (1734-1802); during the reign of George IV he styled himself ‘Principal Painter in Ordinary to the Queen’ apparently on the basis of portraits of Queen Caroline. The portrait was probably commissioned by George IV in the last few years of the sitter’s life. It was at Carlton House in 1816 and in 1828 was sent to Windsor to the ‘New Gallery’ (that is the Grand Corridor); it was moved into the Waterloo Chamber some time after 1878. 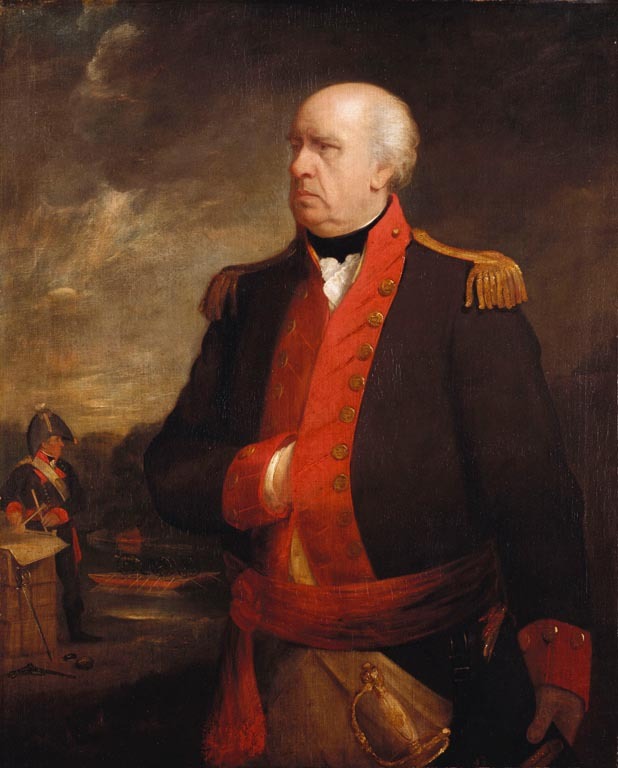 Sir William Congreve was in charge of the Royal Artillery as well as being Comptroller of the Royal Laboratory at Woolwich; his son, also Sir William (1772-1828), was the inventor of the ‘Congreve Rocket’. The elder Congreve is here shown wearing his dress uniform as Colonel-Commandant of the Royal Artillery; in the background is a river on which is a pontoon carrying light field guns; a uniformed gunner stands with papers and surveying instruments resting on packing cases. One paper is inscribed R:M (for 'Royal Military') REPOSITORY 1776.